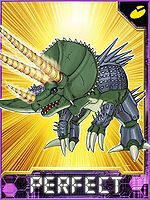 Although it is a Ceratopsian Digimon with offensive power that competes for first or second with herbivorous dinosaur-types, it has a gentle personality, and the sturdiness of its skin is top class among biological Digimon. The three horns growing from its head spin rapidly, so its penetrating power has further increased. 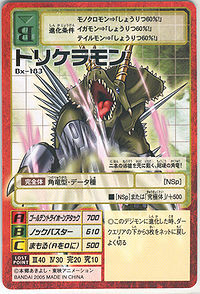 Special Move: "Golden Tri Horn Attack", which added the high-speed rotation of its horns to "Tri Horn Attack". 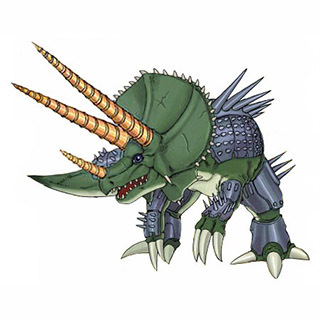 A bipedal Ceratopsian Digimon that has the appearance of the Triceratops, which has offensive power competing for first or second among herbivorous dinosaurs. The sturdiness of its skin is top class among biological Digimon. Just like its skin, the two horns growing from its brow are super-sturdy, and are far harder than that of Monochromon. It has a fundamentally gentle personality. However, its charging attacks have the offensive power to obliterate even the sturdy-bodied Mineral-species Digimon, though you wouldn't guess it from its ordinarily sluggish movements. 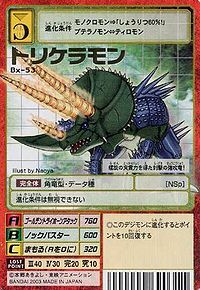 Its Special Move is charging at the opponent with the two horns on its brow and the horn on its snout (Tri Horn Attack). The three horns growing from its head spin rapidly to pierce anything that comes to attack it, so its penetrating power has further increased. Due to its gentle personality, it is often attacked by the enemy, but it will try to hold them off using the sturdiness of its skin and its Spike Armor. 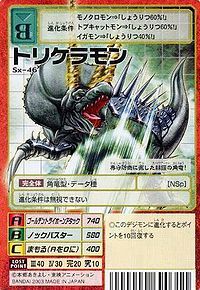 Its "Golden Tri Horn Attack", which added the high-speed rotation of its horns to its Special Move "Tri Horn Attack", is a Special Move with enough power to pierce the enemy without charging into them. | Tricera comes from triceratops. Golden Tri-Horn Attack  ゴールデントライホーンアタック Gōruden Torai Hōn Atakku Rams the enemy with its three horns spinning at high speeds like drills. Knock Buster  ノックバスター Nokku Basutā Attacks with the claws of one foreleg. Triceramon X-Antibody led a herd of Digimon who were running. It is survived Omegamon's cannon blast , but it is injured and had its head crushed by the Omegamon killing it and leaving with horn and fluid. A bunch of them were a part of Silphymon's rebel group. Evolves from Allomon X-Antibody, Ginryumon, Growmon X-Antibody, Monochromon X-Antibody, or Tobucatmon. Can evolve to Dinorexmon, Dinotigemon (2.0), Medieval Dukemon, Ouryumon, Ulforce V-dramon X-Antibody, or Ultimate Brachimon. Can also Jogress with Hisyaryumon to evolve into Ouryumon, or Jogress with Okuwamon X-Antibody (1.0/1.5) or Alphamon (3.0) to evolve into Ultimate Brachimon. Evolves from Igamon, Nohemon, or Tyranomon. Can evolve to Rosemon or Spinomon. Can also Jogress with Yatagaramon to evolve into Valdurmon. This spike-armored ceratopsian has devoted itself to non-aggressive defense! This strong offensive dragon has attained added drilling power for its piercing attacks! This super-hardened ceratopsian crowned its helmet with two dangerous lances! This page was last modified on 10 November 2018, at 11:56.